Beautiful Anniversary Card. 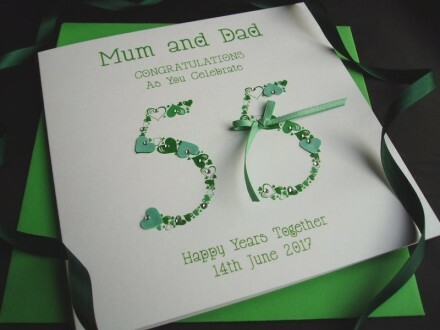 This lovely card is the ideal choice for a married couple to convey your very best wishes for their special 55 years of celebration as husband and wife. This card features an image of emerald heart numbers 55 styled with a smattering of shimmering hearts and a satin bow.